The Denison Barb is a handsome, active fish hailing from southern India. Its sudden popularity, however, led to overharvesting; as a result, it is now on the endangered list. If you choose to include Denison Barbs in your tank, you'll need to buy several—and you'll need a fairly large freshwater tank. This species was first described in 1865 and is endemic to Kerala and south Karnataka in the southern area of India often referred to as the Malabar Coast. They are found in large schools in pools, streams, and rivers that are generally heavily vegetated and rocky, with water that is highly oxygenated. Like many species, the Denison Barb has been referred to by several scientific names as well as a host of common names. Currently, the accepted scientific name for this species is Puntius denisonii. Prior scientific names include Barbus denisonii, Barbus denisoni, Crossocheilus denisonii, and Labeo denisonii. In their native country of India, they are often referred to as ‘Miss Kerala’. Other common names include Bleeding Eye Barb, Denison Barb, Denison’s Flying Fox, Red Comet Barb, Red Line Barb, Red Lined Torpedo Fish, Roseline Shark, and Torpedo Barb. This Barb is an example of what can happen to a species that is wild caught and suddenly becomes in high demand. After being named as one of the top new fish species by Aquarama, the international ornamental fish exhibition, this fish quickly became quite popular. Within a decade, well over half of all ornamental fish exports from India were Denison Barbs. Unfortunately, the result was a significant drop in wild populations due largely to overfishing. Loss of natural habitat as the result of pollution and deforestation has also contributed to the reduction of this species in the wild. Efforts have been made to counter this by instituting periods when collection is not allowed, as well as commercial breeding programs in Southeast Asia and Eastern Europe. However, this fish still remains endangered and is on the IUCN red list. Long and torpedo shaped, it is easy to see why many call this the Red Lined Torpedo Barb. The silvery body of this fish is set off by a black line that runs the entire length of the body from snout to tail. This is contrasted by a brilliant red line that runs just above the black line, running from the nose through the eye and continuing to the mid point of the body. 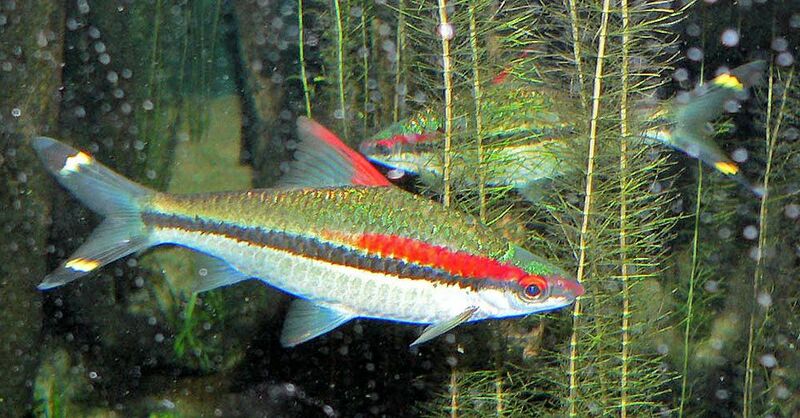 The dorsal fin is also edged in bright red, while the caudal fin is striped with black and yellow stripes. Mature specimens are known to develop a greenish hue on the head. Reaching an adult size of six inches, this species has a pair of barbels that help them locate prey. They are an active species that require lots of room to swim. In recent years, a gold variant has been bred that has the red stripe, but lacks the black stripe of the standard variety. Denison Barbs are generally peaceful, but they can be aggressive and care should be taken to keep them with species that are similar or larger in size. They should be kept in schools, of a half dozen or more; as a result, they are best kept only in larger tanks of 55 gallons or more. Other Barbs, Danios, larger members of the Tetra family, Rainbows, and most Cichlids are suitable tank mates. The key is to provide keep them in a school and provide them with plenty of space. Because this species is large and is best kept in groups, they are suited for larger tanks of 55 gallons or more. The tank should have plenty of room for swimming, as they are an active fish that needs to be on the move. Some hiding places are also recommended. Rock caves or driftwood can be used. Live plants are problematical, because they may be uprooted. However, hardy species such as Anubias can be used, if well anchored. Water conditions are important, as this species is accustomed to high oxygen levels and pristine water. High levels of organic matter are not tolerated well, which means regular water changes and tank cleaning are key to keeping this species healthy. Some water movement is necessary as well, which can be provided with a spray bar or power head. Water temperatures can be lower than for other tropical fish; however sudden drops in temperature should be avoided. The pH can range from slightly acidic to slightly alkaline, and hardness can be up to 25 dGH. Denison Barbs are omnivorous, and will accept many foods. For optimal health, they should be fed a wide variety of food including meaty foods as well as vegetable matter. Live foods will be readily accepted, including bloodworms, daphnia, cyclops, and shrimp. Algae, spirolina, and even fresh vegetables will also be readily accepted. There are few clear differences between the sexes. However, adult females grow a bit larger, are heavier-bodied, and are sometimes less highly colored than males. Currently, there have been limited spawnings reported in home aquaria. These cases have been accidental, and little is known about the conditions under which spawning occurred. However, there have been successful commercial spawning operations in which hormones were used to stimulate spawning in this species. These successful spawnings have taken place in soft acidic water, with the eggs being scattered on plants. Otherwise, check out all of our other freshwater pet fish breed profiles.